You are here: Home / News / EDM News / Live Events / Bad Kids Collective – #BADdayclub – Better, Bigger, BADDER! 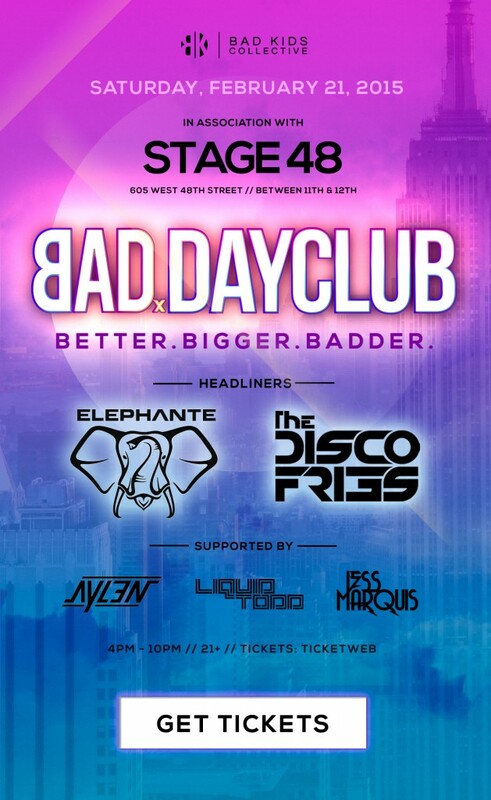 Bad Kids Collective – #BADdayclub – Better, Bigger, BADDER! Sound awesome? They’re not done. They’re having Elephante and The Disco Fries to headline the event along with SiriusXM’s Liquid Todd, Aylen, and Jess Marquis! You will see everything from choreographed fashion shows, day drinking, Vegas in NYC theming, performing arts, SWAG, dancers, robots, battling dance circles, outrageous costumes, PIZZA and our favorite party add-on – a rocking open bar! That isn’t all that we are concocting, but we can’t give away every party secret quite yet … you just need to experience it for yourself! This is what separates us from other event production companies. We put on a spectacle that, we as dance music lovers are pining for – something wild, different, unique. Most importantly, we create an atmosphere straight from our imagination. This will be the ultimate Bad Kids party to date, we are sure of that. The collection is fun, colorful, electric and will remind those loyal to Bad Kids of our roots and brand ethos. The careful combination of Bad Kids-inspired designs and dance music sayings and phrases, makes for a robust set that will be sure to grace the presence of major upcoming festivals this year on both guys and girls. This event is going to be their best event yet. GUARANTEED! I can promise you that. PURCHASE TICKETS HERE!